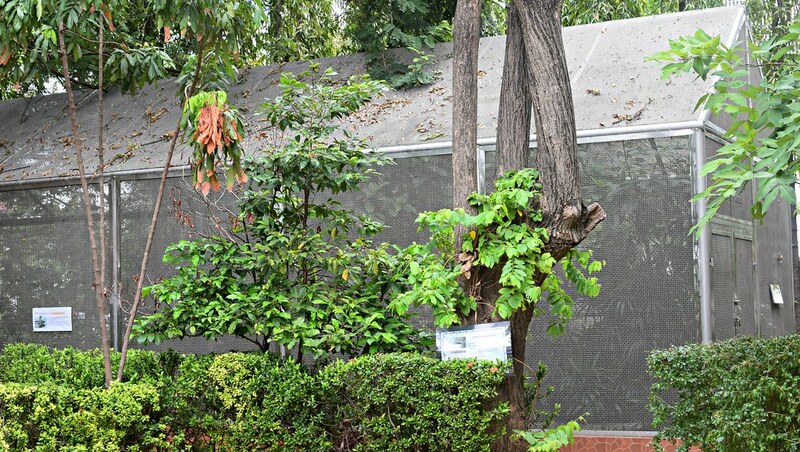 Now it’s no surprise that I like to keep things interesting while abroad, so this past week in Bangkok I decided to explore two avenues, which are a little off-the-beaten path. The photographer works for Wanderlust Travel Magazine, and in his spare time, does stock photography for companies, like Getty Images. Stock photography is supposed to capture daily life, and the model must evoke feelings of contentment, warmth and dreamy reflection. The modeling is TFCD, which means that, for my time, I receive a copy of all the digital images, and a set number of high-resolution photos edited by the photographer. My motive for doing the shoot was simply for kicks and giggles, as well as, something to look back on when I am older, but I did request a few professional head shots for my resume as well. 😀 On that day, I worked with a male model. 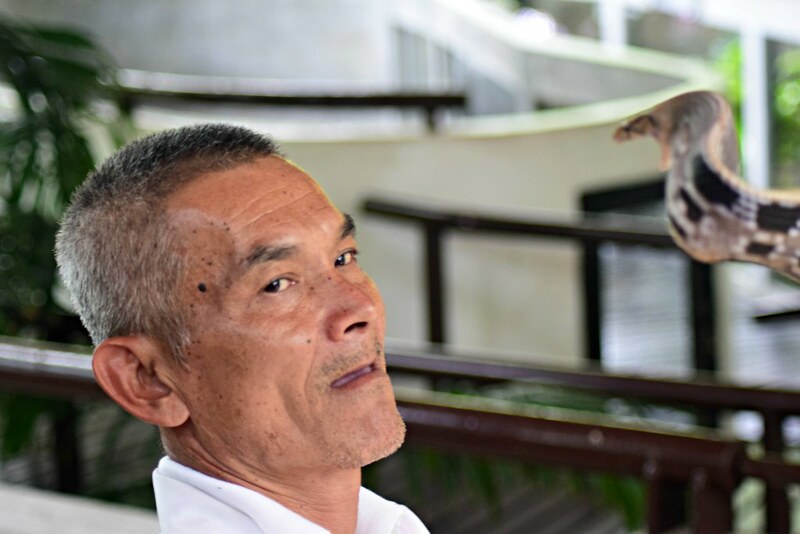 He was a former teacher in Bangkok, who had been casually modeling until he recently received a professional contract back in the UK. We started the day with a few business shots, then hit the streets, acting as a couple of tourists shopping around the city. The hotel even requested that we shoot an advertisement for their Mexican restaurant, and their fine dining rooftop Indian restaurant. Now on a completely different spectrum, let’s talk about a current event in Bangkok that led me to my next adventure. 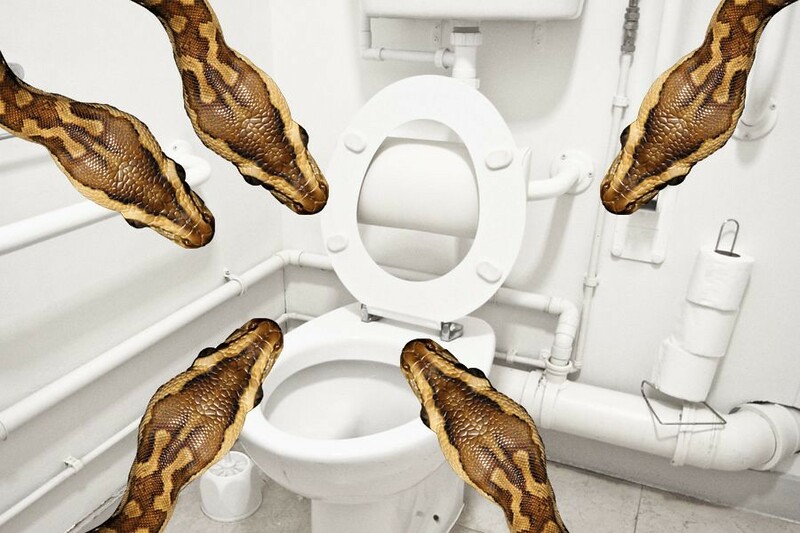 Basically, any irrational fear you have had about a snake coming up and biting you on the toilet is now valid, as last week in Bangkok, a python came up through a man’s plumbing, and grabbed onto his member while on the pot. Yikes! 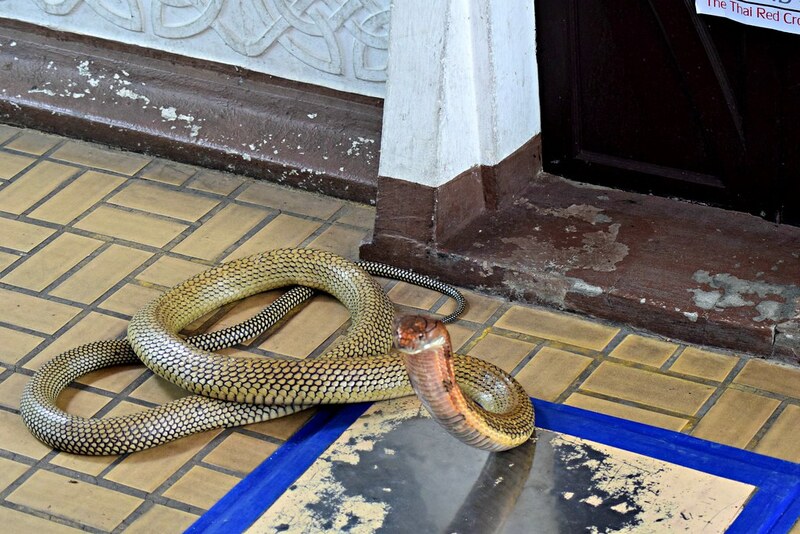 😮 The man fought with the python for awhile, eventually tying it to a door handle with a rope, where he was then rushed to a hospital for blood loss and unconsciousness. Wow! 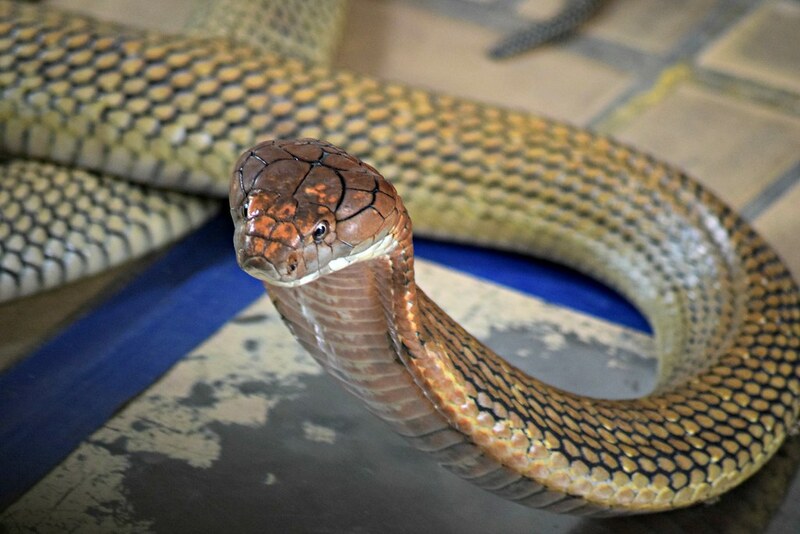 Now, there are over 150 species of snakes in Thailand, with over 60 being venomous. 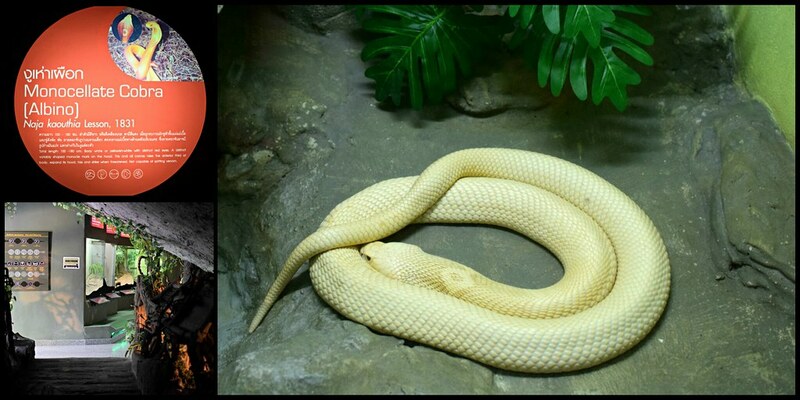 After hearing that news, I thought is was proper time I learn a bit more about these native snakes, and how to handle them during an encounter. 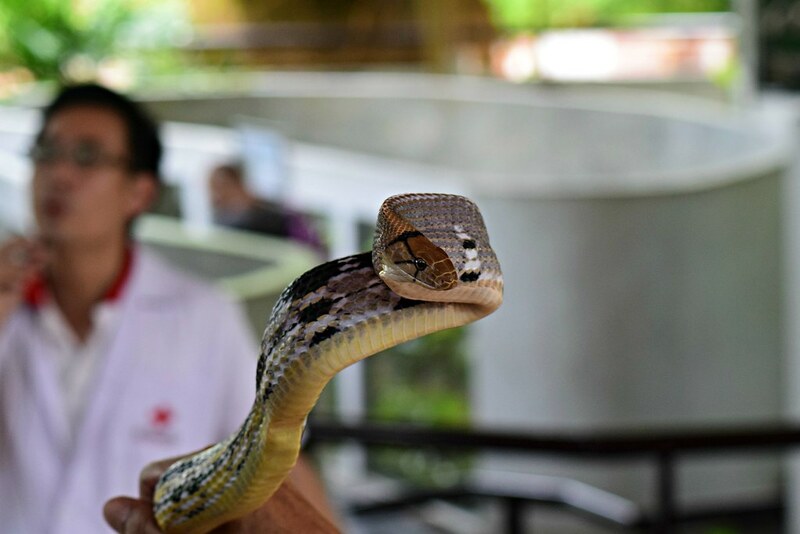 For this I visited the Bangkok Snake Farm. 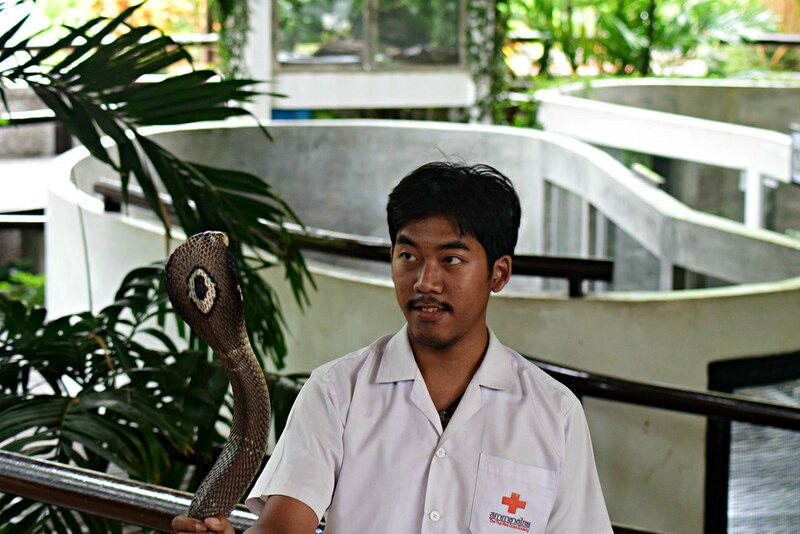 It is aptly funded by the Thai Red Cross, and is the second oldest serpentarium in the world. 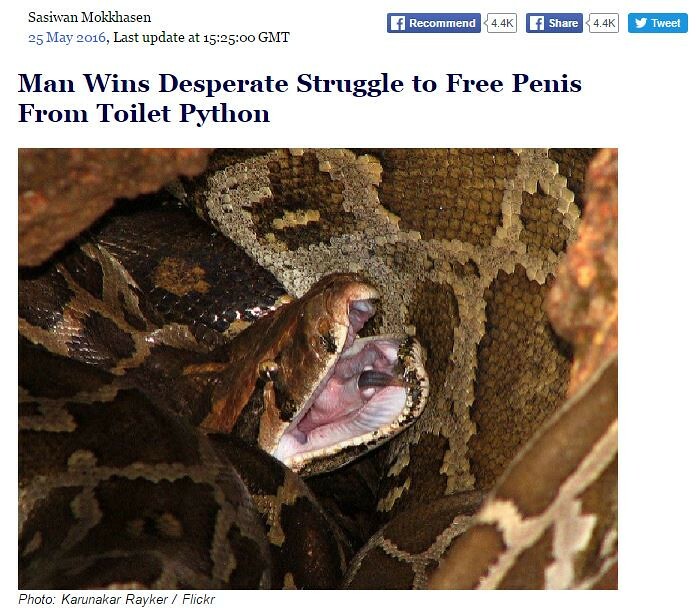 The facilities at the snake farm are spectacular. 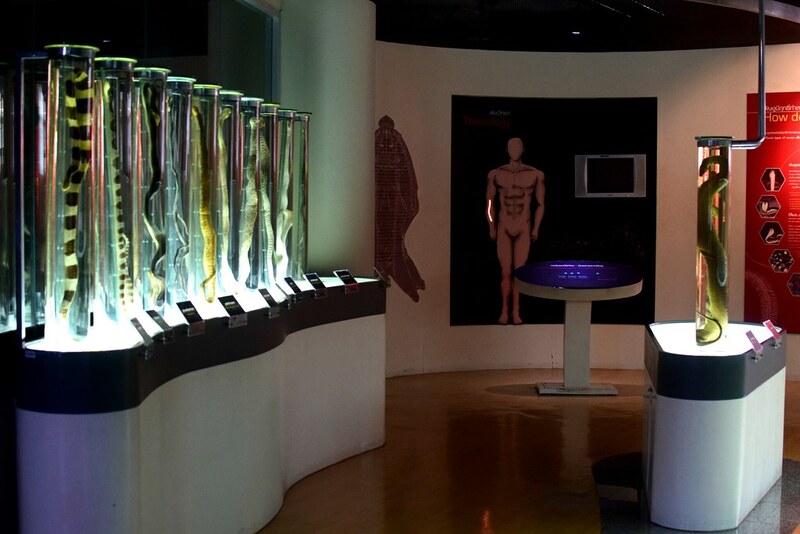 They have a very well-kept serpentarium, with English labeled descriptions of each serpent, plus they have an informative museum with information about the effects of poisonous venom, as well as, basic facts about snake anatomy and physiology. 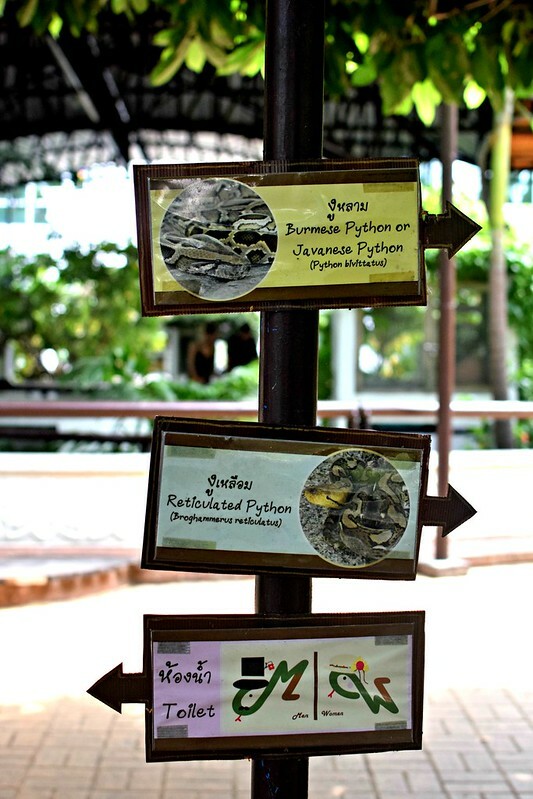 The serpentarium, where cages are labeled to identify whether the animal is venomous, egg laying, nocturnal, and its whereabouts in Thailand. 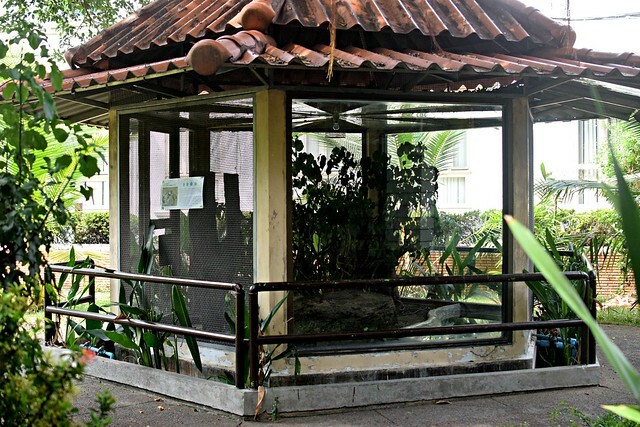 On the other hand, the venomous king cobra enclosure resembled something out of Jurassic Park- possible housing for a pterodactyl. Hah! It’s heavily fenced, with triple padlock doors. Wow! 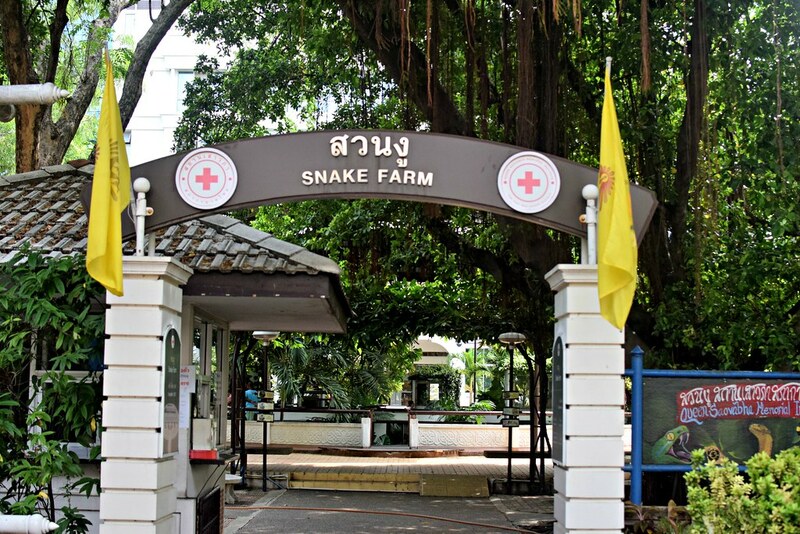 What’s more interesting is that the snake farm is not just a place for education, but was originally founded as a snake milking farm to produce antivenom. 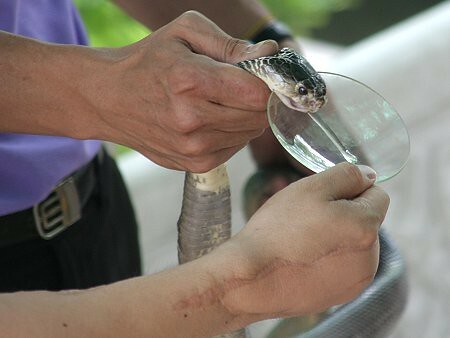 You see, venomous snake bites require a particular antivenom for efficacy, so it’s essential that only native Thai snakes are milked, to produce the appropriate serum. 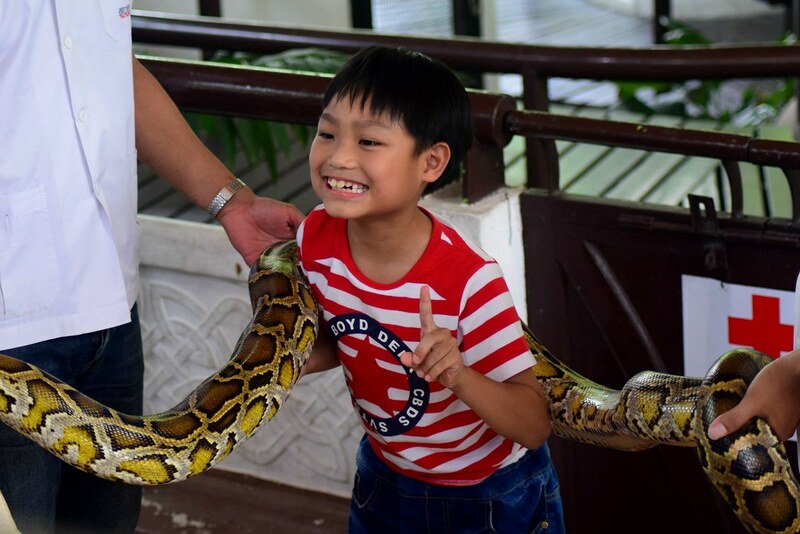 On weekdays the snake farm provides public milking demonstrations, and on weekends, they provide sessions on snake handling. 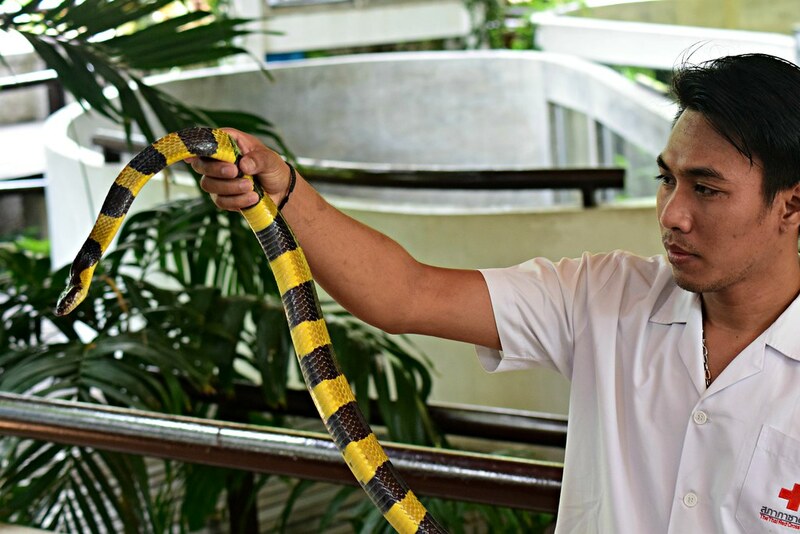 Now during my weekend session, I expected to see non-vemonous snake handling, but that was not the case, as the first snake they brought out was a deadly king cobra. This was one of those times I regretted sitting in the front row. 😥 The speaker even showed us his bite wound from 10 years ago, with such severe tissue necrosis that his skin needed to be grafted from his forearm. 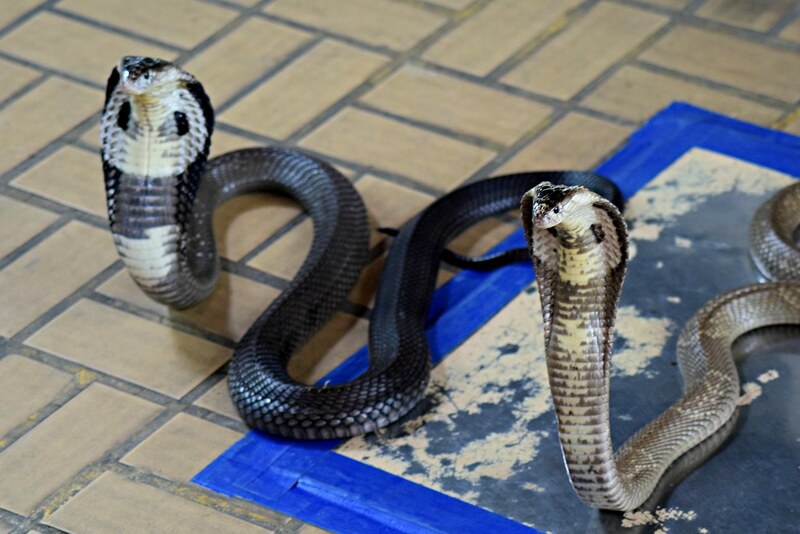 Next they brought an even deadlier snake, the siamese cobra. Luckily, snakes don’t have visible ears, so they don’t hear the same as people, and they have poor vision, so your best advice during an encounter with these guys is to stay as still as possible. 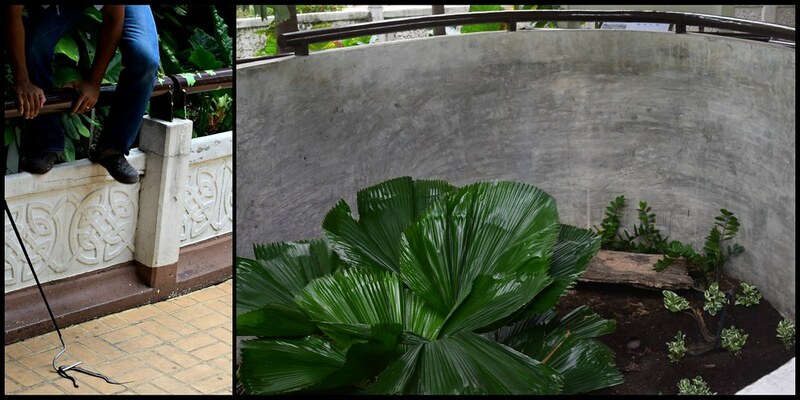 I also had a walk down memory lane as I was reintroduced to snake I had seen in Khao Yai, the deadly green pit viper. Notice how the handlers would gladly grab the cobras, but they won’t even touch this thing! 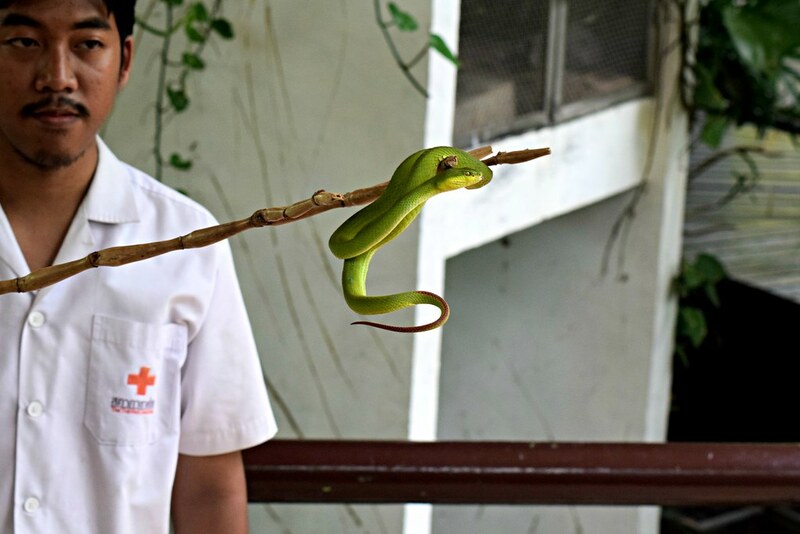 😮 That’s because pit vipers have heat sensing pits, meaning that standing still, this snake will still sense your warm body, and strike at you with excellent accuracy. Your best bet is to keep your distance. And finally we moved on to a krait snake, which is venomous and fast-moving, often being confused with a cobra.